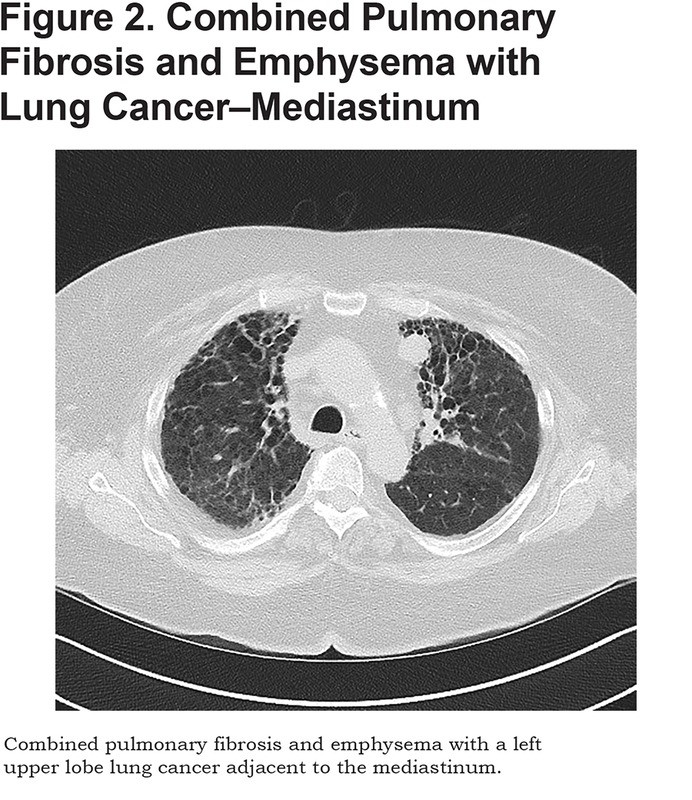 Combined pulmonary fibrosis and emphysema (CPFE) is a disease characterized by both centrilobular emphysema (usually in the upper lobes) and fibrosis (typically in the lower lobes) (Figure 1). CPFE is believed to be distinct from idiopathic pulmonary fibrosis (IPF) and chronic obstructive pulmonary disease (COPD). Patients with CPFE tend to be older males with significant smoking histories. This disease is important clinically because of the increased risk for lung cancer and poor overall survival. The Mount Sinai Interstitial Lung Disease registry contains over 400 patients of which 124 have a usual interstitial pneumonitis (UIP) pattern on computed tomography (CT). Seven of 124 patients (6%) have a working diagnosis of CPFE. Six out of the 7 patients with CPFE are male. The group’s average age is 68 years old. We reviewed all available CT scans of these 7 patients and found that 2 of the 7 (29%), developed lung cancer during the course of their follow-up. For both of these patients the extent of their fibrosis and the size of their pulmonary arteries increased during the course of their disease. For some patients their fibrosis and pulmonary artery size increased without them developing lung cancer while still others remained relatively stable over the course of observation. Emphysema is a relatively common disease effecting 20 of 1000 people in the general population.1 IPF is a rare disease effecting about 30 of 100,000 people.2 CPFE is reported to occur in approximately 8% of patients with IPF.3 As would be expected, CPFE is rare in the general population but was present in nearly 9% of lung cancer patients in 1 study.4 The risk factors for COPD and fibrosis are the same: significant smoking history and older age, so it is not surprising that overlap between these 2 diseases occurs, resulting in CPFE. Those with CPFE and COPD have a longer smoking history on average then patients with IPF. There are likely genetic factors that explain why only some patients who smoke get CPFE. Patients with CPFE are typically males, 65-70 years of age, with dyspnea, abnormal spirometry, impaired gas exchange, exercise-induced hypoxia, and characteristic findings on imaging.5 Impaired ability to breathe is expected with any lung disease but the combination of lower-lobe fibrosis and upper-lobe emphysema, along with pulmonary hypertension worsen the problem. As described in an article by Kwiatkowska, cigarette smoke is a significant risk factor for lung fibrosis and emphysema.6 Pulmonary artery hypertension occurs in almost half of the patients and can shorten the life expectancy of the patients with CPFE compared to individuals with IPF.5 Hirano describes the case of a 65-year-old with pulmonary artery hypertension, diagnosed on chest CT with an enlarged pulmonary artery. 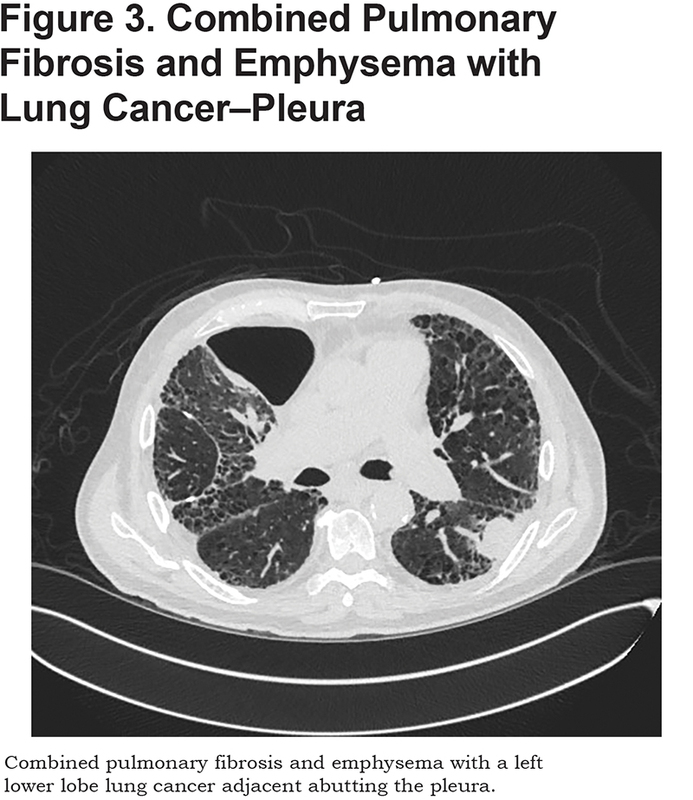 It was not appreciated that the patient also had pulmonary fibrosis until his autopsy.7 Clinical diagnosis can be challenging in patients with CPFE because the obstructive and restrictive problems balance out each other on pulmonary function tests, masking the disease. 1. 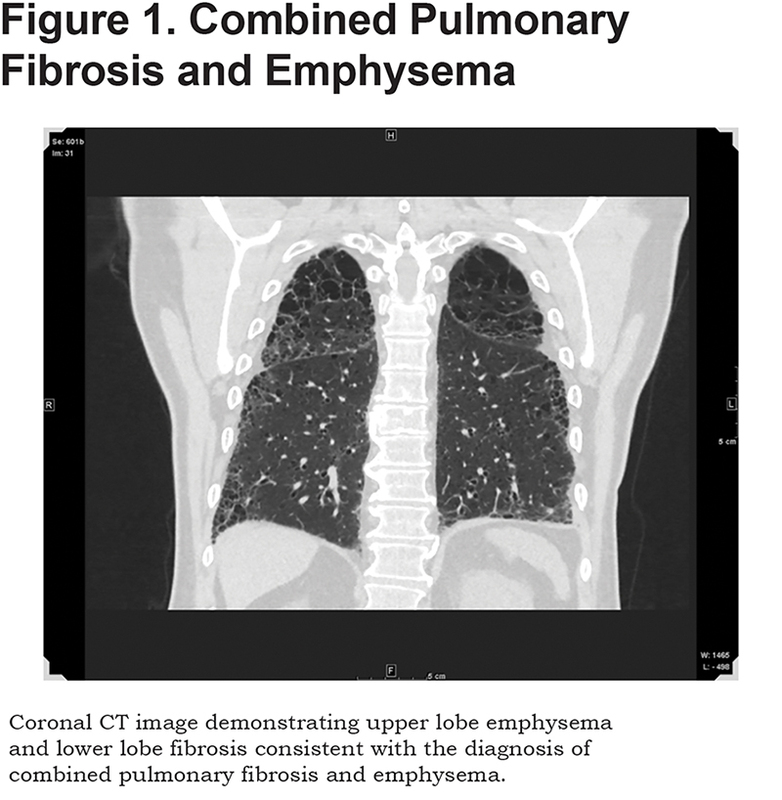 Lin H, Jiang S. Combined pulmonary fibrosis and emphysema (CPFE): an entity different from emphysema or pulmonary fibrosis alone. J Thorac Dis. 2015;7(4):767-779. 9. Wells AU. The revised ATS/ERS/JRS/ALAT diagnostic criteria for idiopathic pulmonary fibrosis (IPF) - practical implications. Respir Res. 2013;14(Suppl 1):S2.